We offer a diverse line of top quality treated products serving the building supply industry. 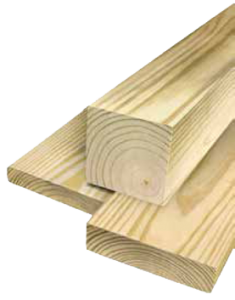 We are pleased to offer MicroPro Treated Lumber and Plywood. Builders, Contractors, & Homeowners Use MicroPro® Pressure Treated Wood Products. SCS Certified – The Micronized Copper Pressure Treated Wood Process is certified under SCS’s Environmentally Preferable Product (EPP) program based on Life-Cycle Assessment. Home Innovation NGBS Green Certified – The Micro Pro® technology has been approved for points toward National Green Building Certification to the National Green Building Standard. Wood products treated with MicroPro technology are now eligible for more green building points than any other treated wood product in the market. UL GREENGUARD GOLD Certification – The MicroPro preservative has undergone rigorous testing and met stringent standards for low volatile organic compound (VOC) emissions. Products certified to this criteria are suitable for use in schools, offices, and other sensitive environments. Lighter, more natural wood appearance. Improved painting and staining qualities. Better corrosion resistance for code-approved fasteners and hardware. Carbon steel fasteners may be used for interior, above ground, weather-protected applications such as sill plates, interior framing and interior trusses. End uses include interior and exterior above ground, ground contact, and fresh water immersion. MicroShades®, innovative micronized pigment color choices – pressure treated wood colors similar to redwood & cedar. Treated wood warranty programs (See warranty for details). Building code compliant. ICC-ES Report, ESR-2240.